Alacrity Server & Workstation Movers, Inc.
We specialize in the movement or transport of sensitive equipment. We provide the engineering services, equipment, insurance, and expert personnel to ensure that the integrity of the transported equipment is maintained. 17% of equipment is damaged during a move, according to federal studies. The damage to the equipment, may be just cosmetic. 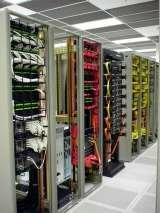 However, with computerized equipment, such as servers, workstations, medical imaging equipment, robotics, restaurant equipment, or musical instruments, the damage is internal and results in lost productivity after the equipment is delivered. We also provide expert rigging, storage, auction, and resale services. Email Alacrity Server & Workstation Movers, Inc.
Review Alacrity Server & Workstation Movers, Inc.